TLC4Environment: ''Sirikal Saidia!'' - Floods of pain, water for gain? ''Sirikal Saidia!'' - Floods of pain, water for gain? A few years ago a woman from the western part of the country made headlines with the catchy phrase 'serikal saidia' literally meaning 'government help'. This was after a heavy downpour in the area which lead to the loss of her children and husband. It was very obvious that the woman was totally distraught, blaming the floods and the government for the bad omen that visited her home. Her accent made the phrase catchy, and most people instead of pitying her, laughed at her and the statement, making all sorts of jokes. Well to say the least, it was more of a national joke, with most of us having not experienced killer floods and not knowing that a wave floods would affect some of us in years to come. It is only a month ago that Nairobi was surprised by days and nights of floods, which caught many unaware. Okay, not that Nairobi has not been experiencing heavy rains from before, but this time round it was not the usual rain. Roads and tunnels were flooded, and houses too were not spared. motorists came to a halt, squeezing into petrol stations and road sides to pave way for the raging waters. Others tried to drive through the water, and thus exposing their cars to other threats from the furious waters. Sadly, others lost their lives, being carried away to their deaths. Many were devastated, I mean everything else seemed to obey the waters, the traffic jams, the hiked 'matatu' prices and also the amount to pollutants driven right into the fronts of our houses. Others made money out the situation, like the mkokoteni carts that ferried several to work, making a killing from business unusual! 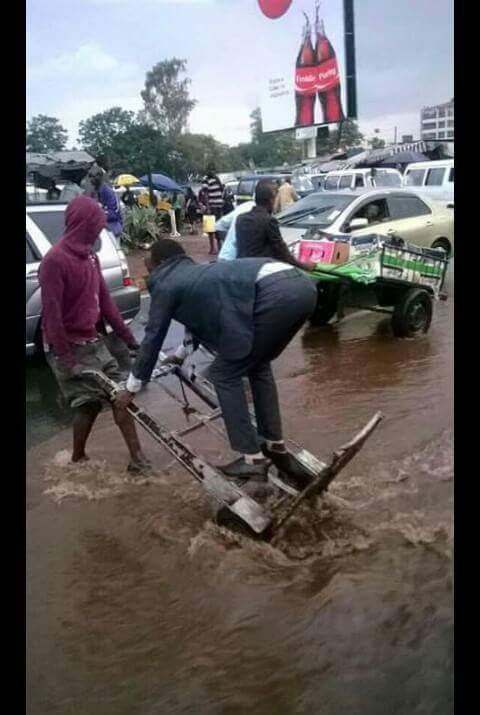 The hashtag #NairobiFloods was trending, and I admit I too was a victim of the floods and posted about the day I got home at 2.30am from Nairobi CBD after taking seven hours on the road, and having experienced a road trip in areas I've never been to. 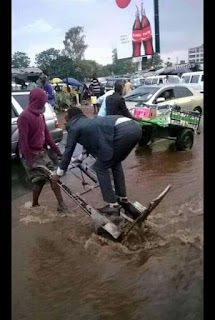 With the floods, many became aware of the weatherman and his predictions, anticipating any news on sun rays! Many admitted that some years back it never rained that much, and floods never killed as much. Others recalled the El Nino, I remember when I was younger I heard that name and it sounded fancy, not knowing the grave matters that the word carried. Anyway, with many now paying attention to the weather and thirst for more knowledge about climate, I thought it would be best to also do much more research on the issue. I watched several being interviewed on what they think about the floods. Many have blamed the 'government' as usual for the floods. Yes I mean the government calls the shots on how much it should rain and where it should flood, where the sun should shine and how intense the rays should be and all...okay, sarcasm alert, but I feel the government is partially to blame as well as we the citizens too. Corruption cases in this country are rather common, 'toa kitu kidogo' and there you go, build a complex on the drainage system! After all, who cares?? Even if In the areas that Kenya had a dense forests like in the Mau, large tracts of trees have been cut down for various purposes. This has left the land bare, and when such heavy downpour occurs, water flows downwards in high speeds also carrying away the loose top soil. Other than that, Nairobi city and other parts of Kenya are filthy dirty, I mean who has not seen huge piles of garbage and trash on the road sides? Where I live, most people with stone wall fences are unfortunate because most of wastes from the neighbouring areas are dumped at your fence at ungodly hours. I have also seen, 'waste collection trucks' and I put this in quotes because they do not serve the purpose they are intended for. Most are not roadworthy, stuck next to someone's fence, with the wastes open and emitting a foul stench; and being manned by gangs of 'chokoras' with huge sacks taking anything they find valuable to them. Also, littering has polluted and contributed so much to the blockage of drainage systems, hence not giving way to floods waters. Food waste is also a big crisis in this country I think, several markets are the source of tonnes of rotten vegetables and fruits, for example at the Muthurwa area, these rotten foods are dumped on the roadsides and in the tunnels that were placed for redirecting water and sewage. Isn't it funny how some parts of the country are experiencing severe droughts and famine with many cases reported as fatalities from starvation, and also with the loss of large herds of animals while in the other corner of the same country, food is going to waste daily? We also have seen how some milk companies pour out spoilt milk when the supply is much than the demand. Also, with the waters comes water-borne diseases such as the bout of cholera that has currently hit the city, take care my friends!! Even the Kenya Power had to switch off electricity supplies in some estates such as South 'C' (read sea) to avoid cases of electrocution caused by the interaction of water and electricity. In some other areas, houses have been toppled, such as in Mombasa, and landslides evident as well. All this as a result of blessings from above. If our systems were efficient, I believe that all this flood waters could be channelled into rain water harvesting structures and from then utilized for different other purposes, after all, water is an extremely valuable resource.